9th Circuit: Should feds prosecute ignorant endangered species killings? Are people more likely to kill wildlife if they know they can get away with it by pleading ignorance? On Tuesday, a Montana attorney tried to convince a Seattle appellate court the answer is yes. Representing WildEarth Guardians and the New Mexico Wilderness Alliance, Matthew Bishop told three members of the 9th Circuit Court of Appeals that the federal government overstepped its bounds when it created a policy that set an unusually high bar for prosecution of crimes involving endangered species. Under the policy, anyone could shoot a grizzly bear and claim they thought it was a black bear. Likewise, they could shoot a wolf and say they thought it was a coyote. In either case, the person wouldn’t be charged with a crime, and Bishop said that could embolden some to shoot first and ask questions later. In the Endangered Species Act, Congress wrote that it’s a crime to kill a member of an endangered species or do anything that “knowingly” violates the Act. That’s exactly what Montana hunter Chad McKittrick did when he shot a grey wolf in 1995. After he was caught, McKittrick claimed he thought it was a wild dog. But a friend who was with him testified that McKittrick knew it was a wolf as he pulled the trigger. McKittrick’s attorneys argued that federal attorneys should have to prove McKittrick “knew” he was shooting a wolf. But in 1998, the 9th Circuit didn’t agree. McKittrick was found guilty. But even so, a year later, the U.S. Department of Justice created the McKittrick Policy, which went in the opposite direction of the 9th Circuit and instructed federal prosecutors not to request or fight “the use of the knowledge instruction.” In other words, they would only prosecute crimes if they could prove the person charged had known they were shooting an endangered species. Some special agents with the U.S. Fish and Wildlife Service have said that limited their investigations. However, during Tuesday’s hearing, DOJ attorney Kevin McArdle said that wasn’t so, although he did say the decision of whether to bring charges was influenced by the department’s position. McArdle argued the DOJ would prosecute if they had cases, but they don’t. Therefore, McArdle argued, WildEarth Guardians didn’t have any standing – that is, they were arguing a case that had no merit. McArdle argued that most of the time, agents couldn’t find the shooters, so prosecutors had no case, therefore the McKittrick Policy was irrelevent. 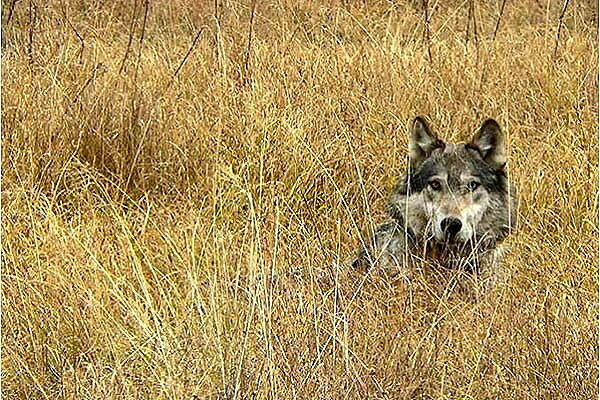 Out of 130 recent illegal wolf mortalities, only 14 were referred for criminal prosecution. Out of those, only four resulted in criminal charges, McArdle said. “The reasons why people shoot Mexican wolves are unknown, because the shooters are not identified in most cases. So the motivation, it’s speculative, it’s conjecture,” McArdle said. Justice Morgan Christen pressed both attorneys to explain the reasoning behind why the New Mexico district judge thought the case was valid and ruled against the McKittrick Policy. “If nobody knew about the McKittrick memo, how is it that it has made any difference whether there is a deterrent?” Christen said. Bishop said the policy changed the decision-making process – it was not just a jury instruction in any given trial. No case was making it to court because of the policy. Since the district court ruling went in favor of WildEarth Guardians last year, the U.S. Fish and Wildlife Service has recently investigated and charged Craig Thiessen for intentionally beating and killing a juvenile Mexican gray wolf in December 2017 in Arizona. If the McKittrick policy is ruled invalid, the hunters’ ethic of knowing what they’re shooting before they shoot could gain more credence.